Wow! Looks like my curious little cheeky is so keen on learning now. Or is it because she was so contented to attend classes since young. Somehow, nothing to loss if she loves attending classes aye? At least she already understand that attending classes is to learn something that we don’t know. By the way, I think mummy will send you to learn swimming by year end holiday. No more delay. As that’s what happened yesterday. But surprisingly she managed to grab the steal ladder and get her head up by herself before mummy grab her. Stunning! but, very dangerous as well. Mummy just got to watch her more closely this time. Of course, she should know how to float on her own as soon as possible too. Elizabeth just fall asleep. Elizabeth is getting very active now. In fact, she is curious about the things around too. She is more like an inspector now. She will inspects almost everything that kept in the house. Her nails grow so fast. Mummy got to cut her nails every 2 to 3 days. And, the scissors type nail cuter is exceptional useful. Easy to use and safe too. This type of nail cuter is specially designed to avoid us from cutting the little ones finger. I better be hard working. If I don’t cut her nails, the long nails will cut her skin as she scratches her backs or legs. She scratches almost her whole body. Damn good at scratching! Anyway, granny is still the one who always remember to cut her nails. Careless mummy! She was about to sleep actually. We were rolling on the bed, kissing each other and laughing happily. Suddenly, she stood up. Running to the conner of the bed and stand by the dressing table as usual. I guess she was about to grab something on the table. But, she slipped. Somehow, mummy was quick enough to get her. She was save. That’s the first time. Then, she did the stunt again later when “kakak” came in. She flew straight off the bed like being thrown out. Her leg get stuck half way. Thus, she came tumbling after. At last, her forehead went knocked on the floor. What a tragedy! That was so hurt! She cried! Non stop for about 15 minutes. As she was terrified. Mummy’s heart was breaking as I see her so pale on the face and her hands and body was shivering a bit. Little Elizabeth likes to climb up the chairs now. She will climb up the chair which mummy placed in front of mummy’s computer once mummy is away. As she was curious about the computer. She even enjoy running on the sofa in the TV room. That’s why she fell badly from this sofa twice. In this case, she will run run run till the end of the sofa and fell over straight away. It’s very dangerous as she might get her neck twisted or get a big bump on her head. In fact, mummy should custom made a sofa that can fully take up all the space between the 2 walls. There should not be holes between the sofa and the wall. That would be safer and surely can prevents Elizabeth from falling from the sofa or bump at the wall. On the other hand, mummy should stop buying any chair with knobs. Especially like those in the house now that have knobs on top of both sides. As Elizabeth playing with her uncle on the bed yesterday, She accidentally bang on the knob of the chair. Immediately, one of her eyes get scratched and was swollen. Today, that side of her eyes is still swollen. What will your kids do when you close the door? Will he or she made a request to open it again? My Elizabeth certainly will, especially when daddy or mummy shut the door and leave her outside the room. She will cry out loud and keep on bang the door, if we don’t open the door and let her in immediately. As she learn to open the door on her own, she always flip the door in and out. That’s dangerous as she might hurt her fingers or tows accidentally. Now, she became smarter. She knows that she must push the dummy door lever to get the door open if the door was initially close up tight. Somehow, she plays with the dummy door lever very often now, even when the door is widely open. In this case, mummy should change some of the old dummy door levers at home to a new and better one. As their gold plated is coming out. Mummy don’t want the “color” to stick on my girl’s hand as she rub on it. That might be toxic. So, I must make sure it will not eventually goes into her mouth. In this case, mummy is sure that I can trust Schlage. Many has learn to invest in education plans for the their kids’ future education needs. Parents nowadays are intelligent. Thus, they will buy insurance for their kids’ medical expenses too. In my opinion, most importantly we as parents should invest appropriate amount on our own life insurance. As we are still alive, we still have the ability to protect our kids. We can still find ways to help them collect their education or medical cost. If we accidentally leave them, the large amount from our life insurance compensation will be their only dependent. Unless we have great sums of savings and other investments. Also, there might be cases we or our kids actually meet auto accidents while we do not buy insurance on our own. In this case, we can ask the help of San Antonio Personal Injury Attorney. Just in case we or our kids need to depend on the compensation to live. This morning, Elizabeth fell down from the sofa again. That time mummy is still dreaming. She was with the maid just like very morning. However, mummy quickly jump out of the bed and run to open the door once I heard a big, loud “bang”. Mummy reached Elizabeth within seconds. Anyway, once I heard the “bang”, mummy certainly know it’s too late. Anyway, even though she cried out loud but there is no serious injury at all. Not even a blue black bump. That’s miracle! In fact, Elizabeth still running happily on the sofa, instead of walking or sitting on it, after the first fall. That’s very dangerous! Thus, don’t expect children to learn their lessons. We parents have to be protective in many ways. I think all mummy can do is to make sure she has no chance to run on the sofa again. Mummy now prefer to bring little Elizabeth out as mummy feels that’s when I have less problems from Elizabeth. Elizabeth can easily cause “accidents” while she is in the house. May be toddlers are naughtier at all their familiar places. I really wish to prove myself wrong. However, it’s very true. Elizabeth has break a bottle of mummy’s sparkling juice this morning. Mummy were so upset. Not because of the sparkling juice of course. Mummy is so nervous as I am afraid little Elizabeth might get hurt by the pieces of breaking glasses. Luckily, she is safe. But, poor “kakak” have to clean and mop the floor which was covered with this sweet sparkling juice. This accident happened as Elizabeth pulled this big glass bottle (which is full of yummy sparkling juice) out from the wine rack which is exactly at the corner of our build-in kitchen cabinet. Elizabeth just pulled, the whole thing drop on the floor and break immediately. That’s close, isn’t it? God bless us as Lizzy was safe. On the other hand, mummy has learned a lesson. Since there is toddler in the house, there should be no more glass items at places where Elizabeth can reach. Elizabeth enjoys playing at the playground nowadays. But, mummy doesn’t really agree with that. After all, baby Elizabeth is still too young. She certainly don’t know how to queue.At the same time, she can’t handle the slides. Usually, she will climb up the slides from the opposite direction instead of sliding down form high up. It’s either mummy, daddy or the maid that is going to hold her and watch her closely while she is at the playground. Parents might argue that these games should be safe as the manufacturers should be very careful. They should be aware that if any accident happen, they might get lawsuit. For example, the victim can ask help from Scranton personal injury lawyer to suit the producers, once there is any injury cause by the kiddie rides. However, we as parents should be mindful on our kids’ safety. In many cases, parents are the person to be blame for the kids’ accidents. In the first place, we should not let our kids involve in any of the activity that might risk their lives. Mummy is so worried about Elizabeth’s habit of picking up some dirts from the floor and even put them in her mouth sometimes. Mummy gets so afraid as mummy is aware that eating dirts might be poisoning. For example, dirts might has traces of methane. In fact, methane gas is everywhere and worst still it really can cause serious poisoning. Oh! It’s seems that methane gas detection is needed for everyone health and safety. Just because mummy needs some “me” time for blogging or other activities, everyday there will be time when baby Elizabeth is took care by the Indonesian maid. I think my maid is good enough. It’s just that she can be careless sometimes. And, I always keep complaining about one bad habit about her. She likes to do some other works or even walk away for something else at the same time when she was asked to take care of Elizabeth. I hate that cause that’s normally why accidents can happen. In short, we must always bathe our baby to keep them clean all the time. In fact, I bathe my little one twice a day. The first time is about 10 to 11 am in the morning. The next one will be around 5pm in the evening. Yet, I will still swap her whole body before she puts on her pajamas at night. Babies tends to sweat a lot. Bathing is to cool down their body and also to wash away the sticky sweats. Bare in mind the sticky sweats may cause rashes or other skin problems. On the other hand, we must be careful with those body shop supplies. Certain body wash or soaps that are too acidic are not suitable for babies. Thus, I am still using organic soap free baby wash. In fact, I am back from Hong Kong 1 week ago. Anyway, poor girl! As this blog of hers is left untouched for more than 2 weeks. Frankly, mummy has no time to blog about Elizabeth for the past 1 week. 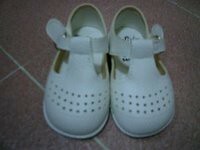 As there are still many things from Hong Kong that mummy wants to post in her other blogs. So sorry, dear… Will you forgive me? But from now onwards, I am going to blog about my little princess again. That’s what I promised. First of all, I have left out her monthly development milestone for this month. And, my girl has grown up a lot. She is so cute now. Busy talking to everyone but unfortunately no one understand her. Anyway, mummy still manged to guess some of her languages. 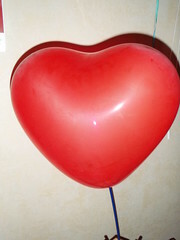 And, it’s a small red heart shape balloon. It’s sweet, isn’t it? Mummy love you, baby. Mummy nearly cry out loud too. She feels so sorry. As usual, mummy were bathing for me this afternoon and playing with me in the pale. However, I don’t feel like staying in the pale anymore after a while. Mummy feel strange. But, she never get me up. So… I got no choice, but for the first time I “poop” inside my “bath tub”. So, mummy quickly get me out of the pale. And, she intend to wash my backside with the pipe water. Thus, she let me stand on my own while she is grabbing the pipe. End up I slip as I try to move my first step. Then, my head bang straight onto the floor. It’s like the sleeping position if you try to imagine. Straight away, I cried out loud! Don’t you think mummy is too careless? Even though daddy did not scold mummy either. But, mummy feels terribly bad! Warning: Never let your baby stands alone when the floor is wet!